Our analysis of actual client returns, as well as changes in marketplace underwriting policy, drove our decision to adjust the Assertive strategy’s Target Net Return. Due to the previously higher expected loss rate of the strategy, as a whole, client accounts experienced more significant volatility – making it the case that some client accounts met the return target, while others had returns materially different from aggregated returns. With these changes, we feel confident that the lower risk of the portfolio will reduce the standard deviation of returns. Our analysis indicates that this should materially reduce the range of actual returns for Fully-Managed accounts – especially those using the Assertive strategy. Additionally, as discussed below, this slight reduction in overall target return is aimed at making client portfolios more resilient to an economic downturn. While our overarching goals with these updates were similar for both Lending Club and Prosper marketplaces, the actual changes are different – as both use different underwriting models and credit attributes. Therefore, in this post, we will give an overview of the changes for each marketplace. 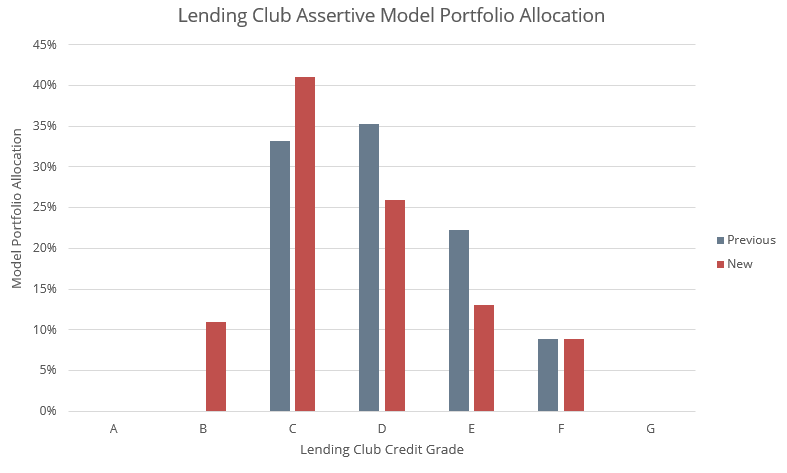 The most notable change we made to model portfolios was more heavily allocating to lower-risk notes (primarily B and C assigned credit grades). Our review of recent Lending Club and industry-wide credit performance indicates some weakness within higher rate loans. With credit model optimizations, we were able to maximize forecast returns in these grades to make them attractive even for our Assertive strategy. These optimizations, coupled with significant rate increases (300-600 basis points) in the higher risk grades increases the appeal of Lending Club loans. While we believe that a recessionary environment is unlikely in the immediate term, we take a cautionary approach to the medium term — 6-18 months outlook. Considering maturity on Lending Club loans have historically averaged ~ 2.07 years (36-month loans) and ~ 3.03 years (60-month loans), we make moves now to better position our portfolios for the future. As we began work on the model updates, our analysis of the 2014-15 vintages at Prosper indicated strong performance in the higher credit quality loans, but rather mediocre and poor performance in mid and lower quality grades respectively. It should be noted that Lending Club performance in the lower quality spectrum was also fairly poor, but was more isolated in impact. The chart below highlights the high loss rates and relative risk for C, D, E, and HR rated Prosper loans relative to the higher quality loans with lower risk and similar or even better returns. However, this is not an indication of portfolio performance for our Fully-Managed strategies. In fact, we find that it has historically been possible to achieve significant alpha (excess return over the index) with the active selection strategy we have designed. Additionally, performance in 2015 Assertive client portfolios was, on average, higher with Prosper than with Lending Club. It is important to note that past performance is never a guarantee of future results. Our model has historically been able to effectively target high yield within Prosper portfolios and still manage risk well. It should also be noted that Prosper’s interest rate changes over the last year are dwarfed by Lending Club’s rate increases in the higher risk grades. However, Prosper’s rates already were, on average, higher than Lending Club’s in 2015 – particularly at the end of the spectrum. Over our period of measurement (6/1/2014-6/1/2015), the average borrower APR for the Lending Club Assertive strategy was 15.44%, as compared to Prosper’s 18.31%. While our model portfolio allocation remains fairly stable with Prosper, we did remove HR-rated loans from client portfolios. This decision was made based on substantial loss rates that did not meet the guidelines for even the Assertive strategy. Additionally, HR loans did not meet our portfolio requirements for risk-adjusted returns; the loss rate on this category have typically far exceeded the net returns. Below, you’ll find estimated returns for each Prosper strategy. Despite the most significant changes being made to our Assertive strategies, it’s important to also consider the risk or loss rate associated with each strategy. In fact, the Balanced strategy has historically offered the best risk/reward tradeoff. However, it’s important to consider your broader portfolio and individual investment objectives when making decisions for your current or prospective p2p portfolio. NSR Invest strategy performance reflects backtested results only – not an actual composite of managed accounts. Measurement period includes loans issued from 6/1/2014-6/1/2015. Assumes NSR Invest fees of 0.60% per year and idle cash drag effect of 0.25% per year. Lending Club and Prosper strategies are weighted to reflect the approximate distribution of Loan Grades for each NSR Invest strategy. Past results are never a guarantee of future performance. NSR Invest recession strategy performance estimations reflect backtested results only – not an actual composite of managed accounts. Measurement period includes loans issued from 6/1/2014-6/1/2015. Assumes NSR Invest fees of 0.60% per year and idle cash drag effect of 0.25% per year. Lending Club and Prosper strategies are weighted to reflect the approximate distribution of Loan Grades for each NSR Invest strategy. Recession performance estimated by simulating a loss rate increase of 3x historical loss rates for the period of measurement. Past results are never a guarantee of future performance. This post is for informational purposes only and should not be considered investment, tax, or accounting advice.